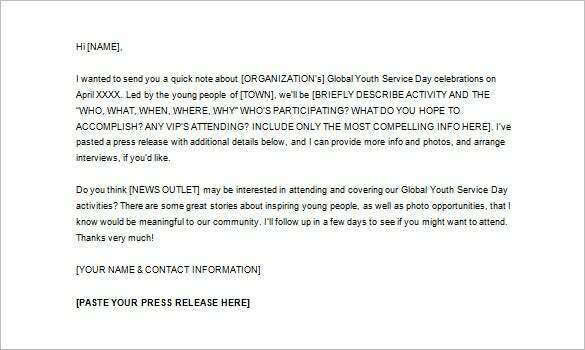 Press release is an important promotional tool for any business. You can utilize it to inform your audience about your new deals and latest happenings taking place in your company. 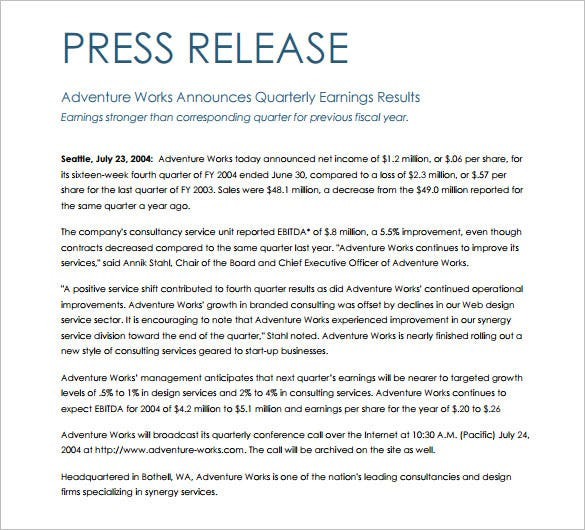 A proper press release from your side helps to inspire good media coverage for your business and effectively take your name across your desired target niche. 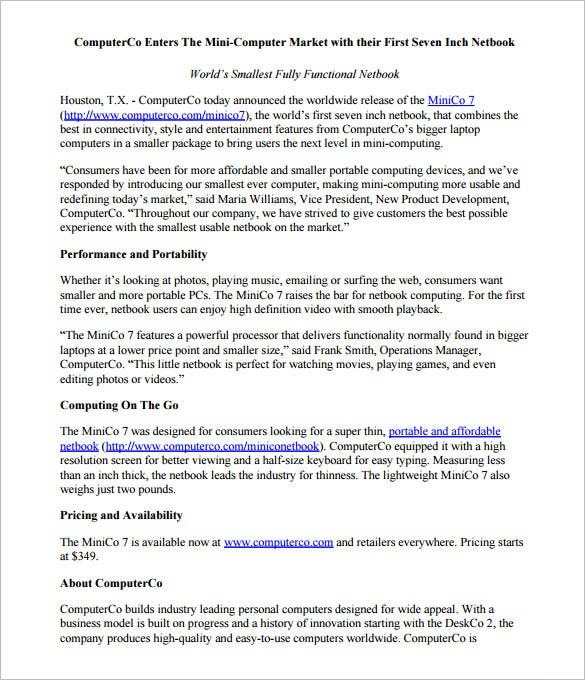 In case you don’t know how to format a proper press release for your company, take to a readymade press release template sample. 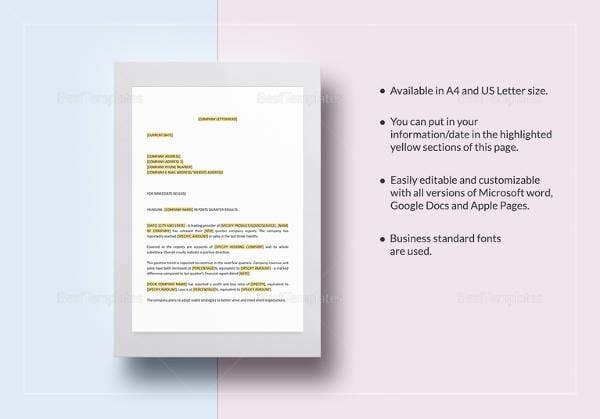 If your company is launching something new or is about to offers some special deals lately, you must inform your audience with a Microsoft word press release template example. 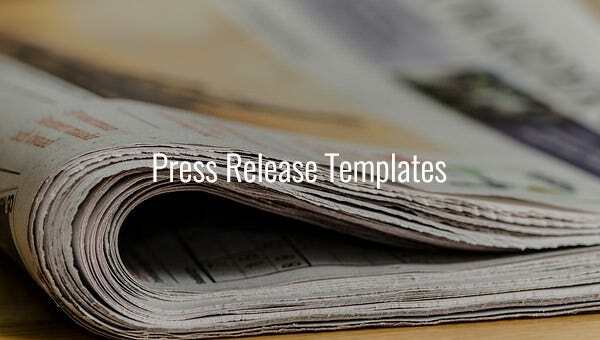 These templates come up with a pre-defined PR structure which is easily customizable and saves you from creating the entire press release from scratch. 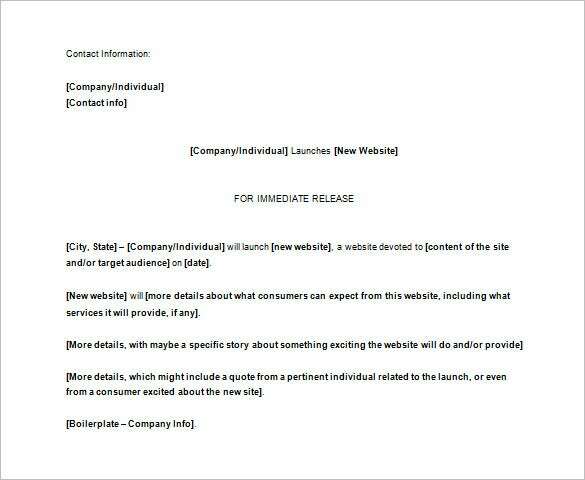 Are you about to release a press release on behalf of your company and want to know about the right format? 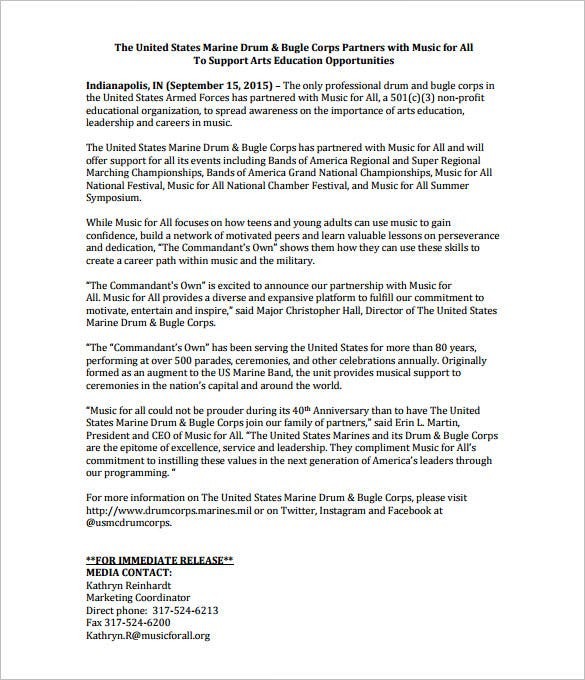 Well, a press release format template word doc starts with a headline, followed by sub-head, dateline, lead sentence and call to action. 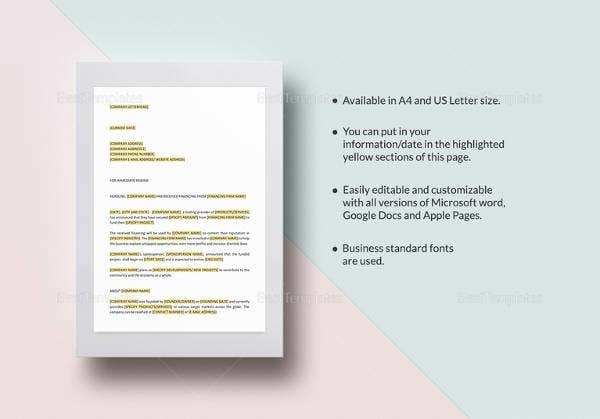 You will conclude the PR with copy body and contact information. 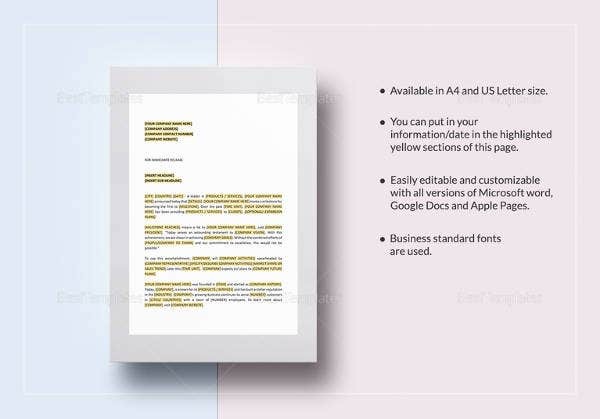 If your company is planning to host an event lately and you are looking to create a buzz about it to garner solid attention from your target niche- an event press release template word doc is the right help for you. 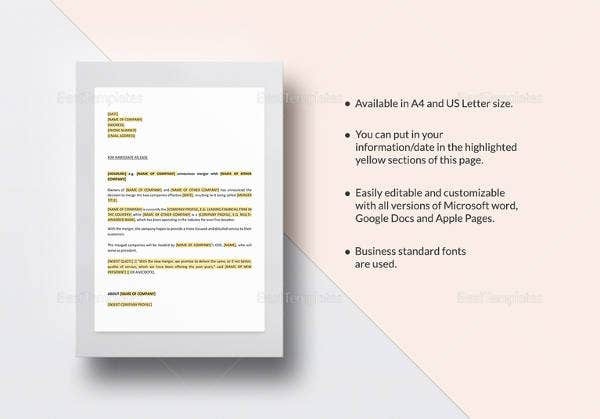 It will enable you to present the event information in a report format that further adds on a serious undertone to it. 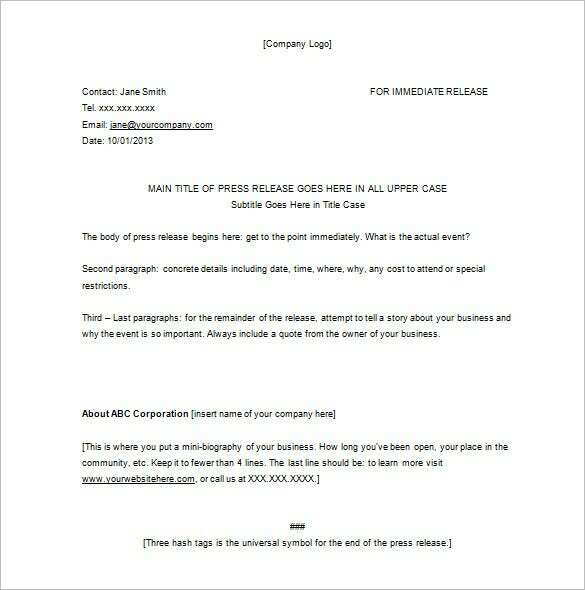 A lot of companies, especially the start-ups, want to know how to write a press release template sample? 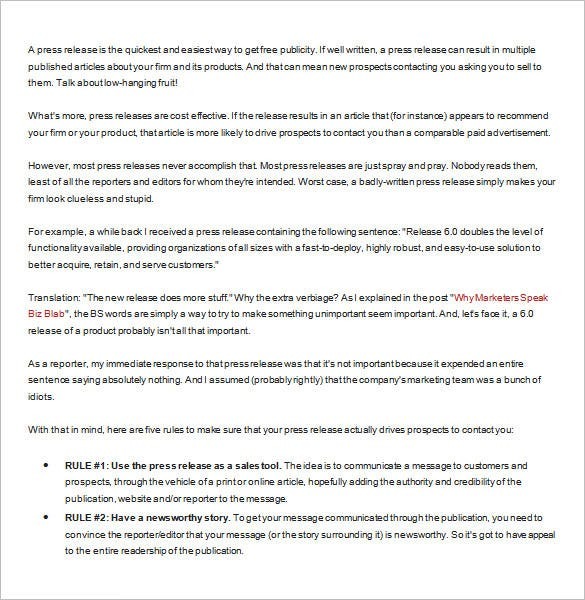 Well, a standard PR for promotion frames a special message from the company- like new deals or product launch- in the form of a news report without taking the direct promotional tone. 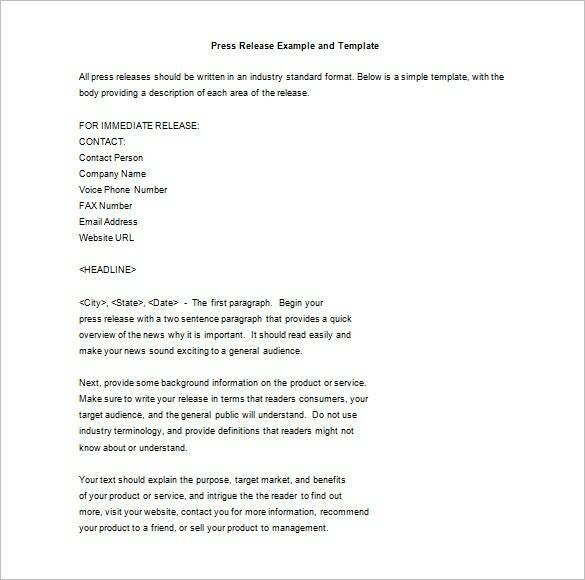 A book press release template example is a must to create the buzz about the launch of your new book. The PR will offer a brief detail on the main theme of your book and if possible its connection to the society as well. 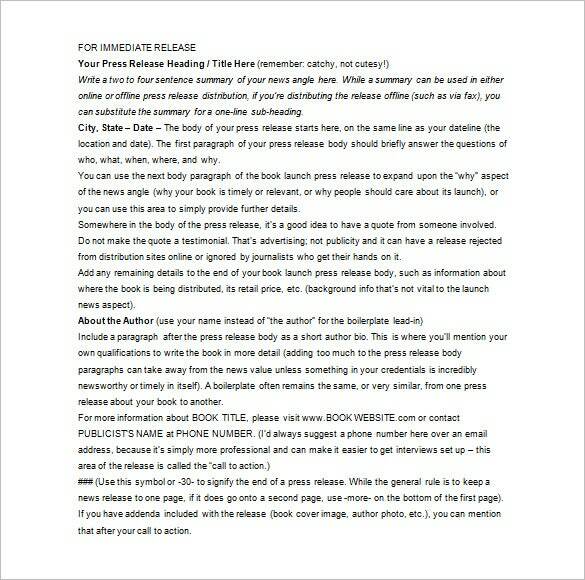 It will also inform about your book’s launch party. 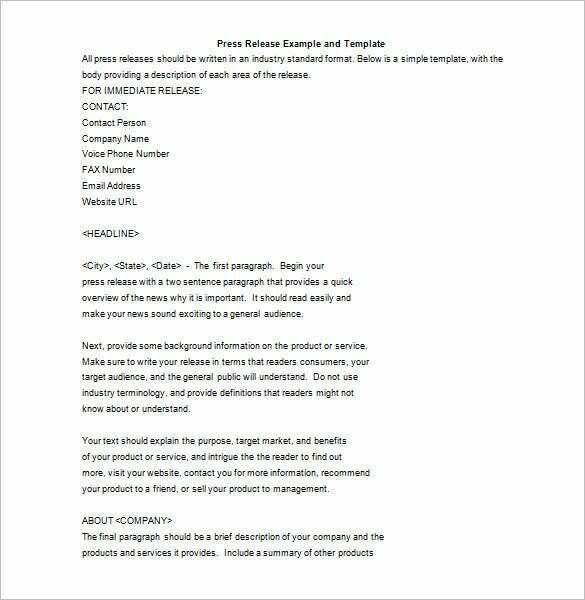 Press release is one of the most important promotional tools taken up by the companies since the inception of the advertisement industry. 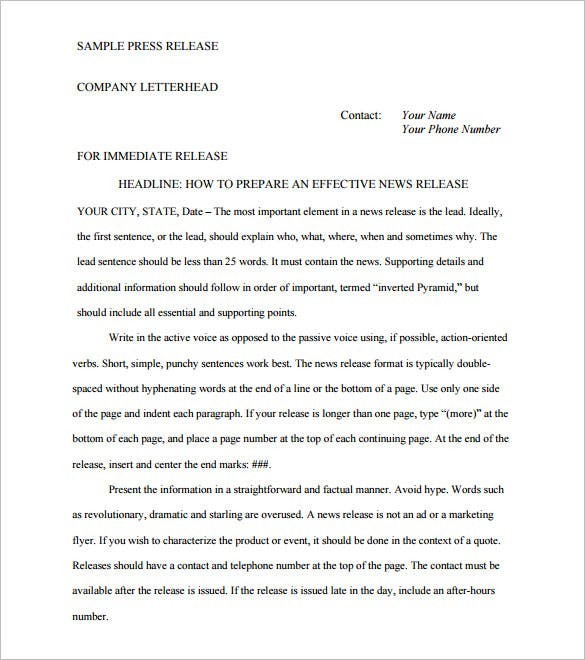 A sample press release template example begins with an attention-grabbing headline, followed by sub-head, dateline, lead sentence and call to action. 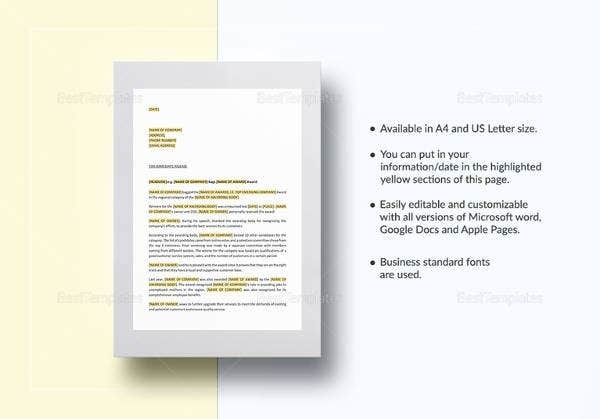 The last 2 points would be copy body and contact information. 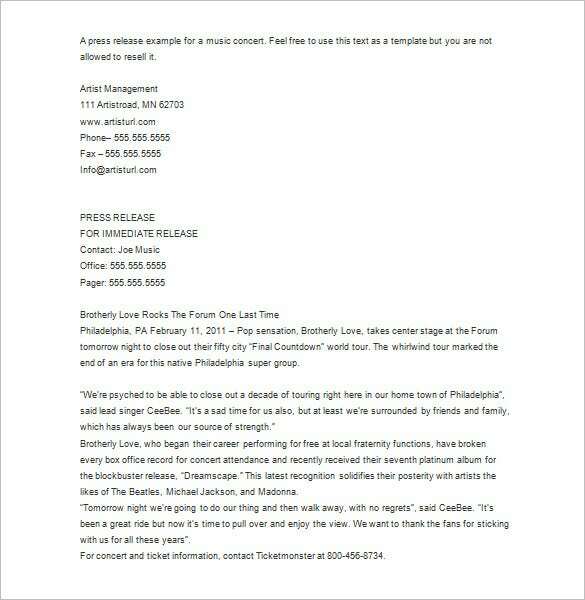 A music press release template example is a wonderful aide to spread the word about the launch of a new music album. 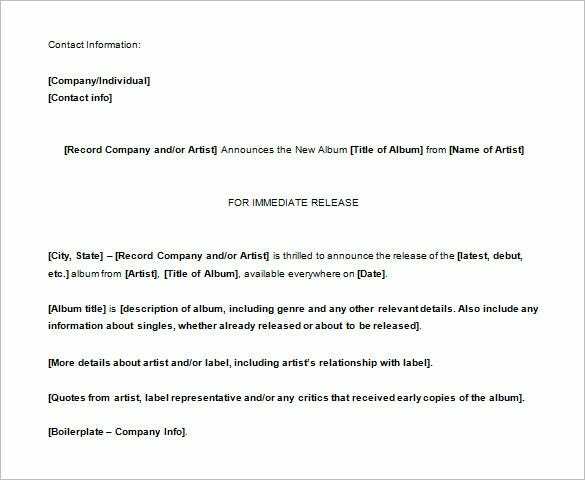 The PR will introduce the album to the world and would also explain the theme of the music along with concise data on the music artist or band. 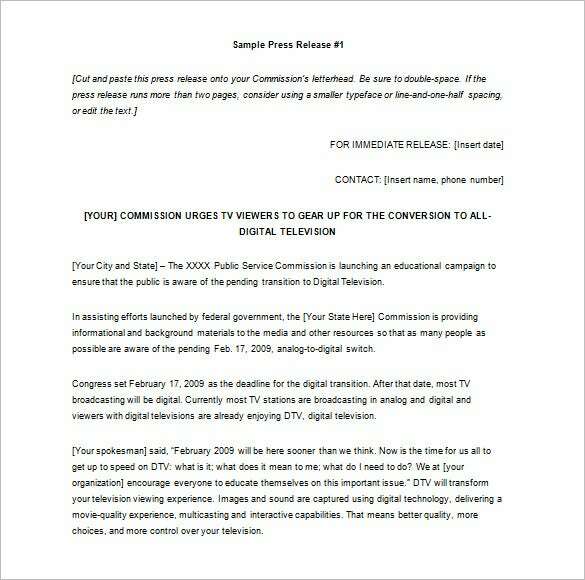 Press releases are an important aspect of any email marketing campaign. 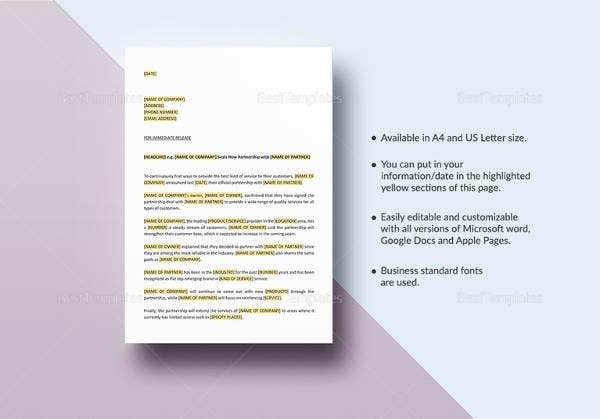 A press release email template sample is usually shorter in comparison to PR for print media and is generally restricted to 400 words. 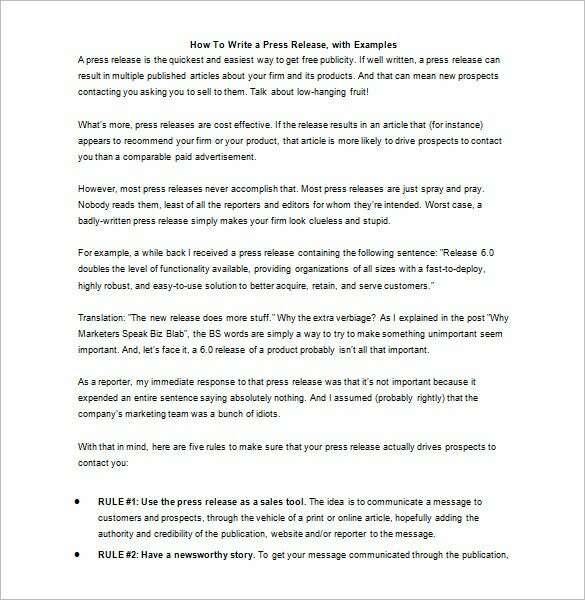 The entire PR body must be divided into 4-5 brief 2-3 sentence paragraphs to ensure good readability. 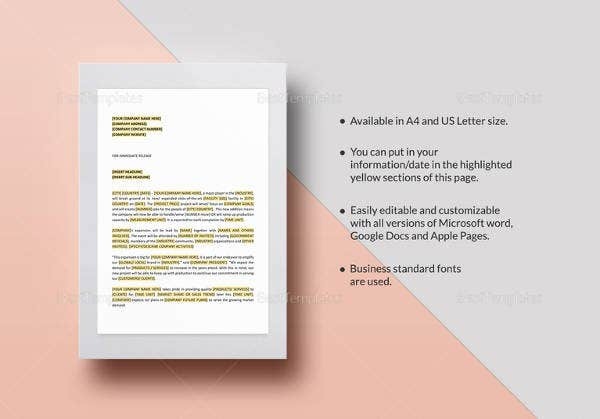 A simple press release template word doc is generally a short one, limited to 350 words (PR body). It usually starts with some latest happening in your firm, followed by a neutral report about your company. You cannot use any sort of direct promotional tone throughout the PR except within quotes. 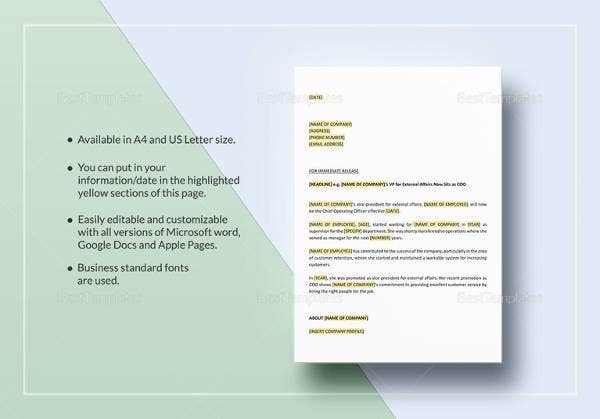 If your company launches its new website online, you must make sure to inform your customers about it through a new website press release template word doc. 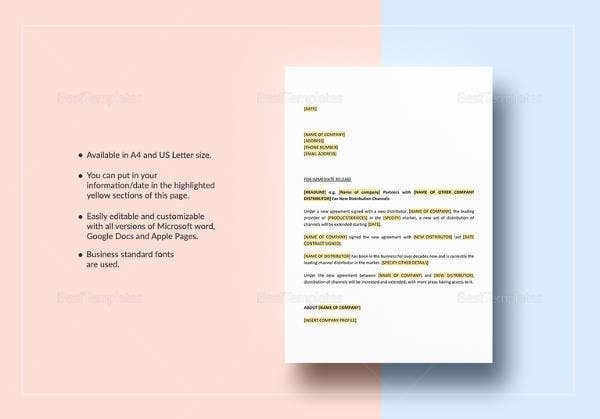 It will send the message to your audience that will in turn help to popularize your new website as well- garnering interested traffic to the portal. With the growing importance of social media sites as promotional portals today, it is important that you make PRs for the social networking portals as well. 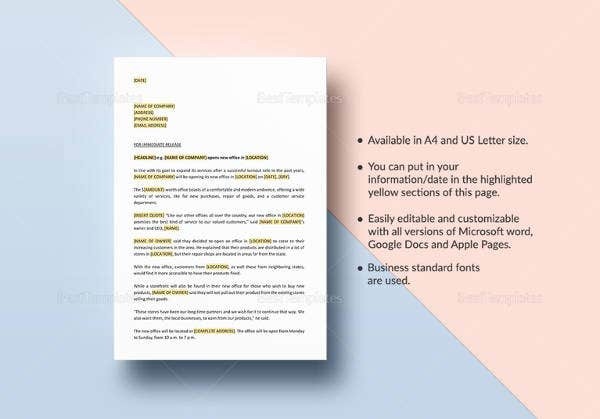 A good social media press release template sample would include Tweetable content, links to some rich contents, image links, twitter hashtag & widget & quotes with pertinent sound bites. Is your band planning to launch a new album lately or about to perform in an upcoming concert? 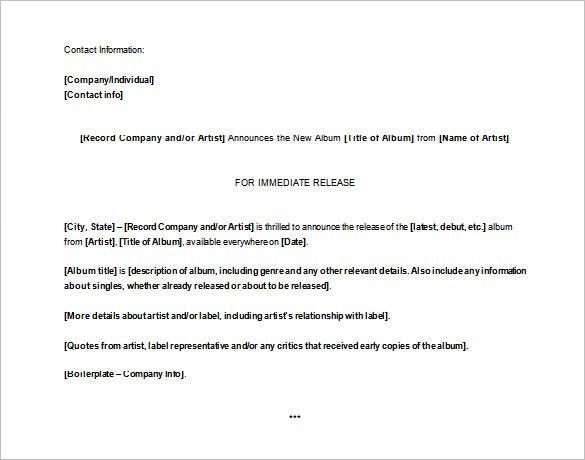 Well, then you must come up with a band press release template word doc that will spread the message across your fans so that they can stay informed about your latest activities. 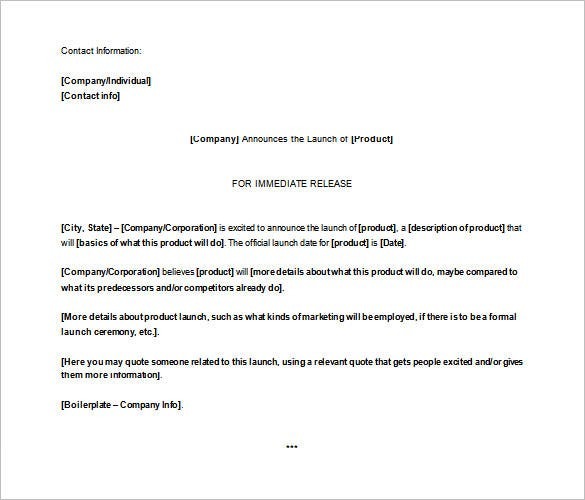 If your company is about to launch a new product lately, you should inform your peers and customers about the new launch with a product press release template sample. The PR will introduce the new release to your market along with data on the features, importance and usability of the launch. 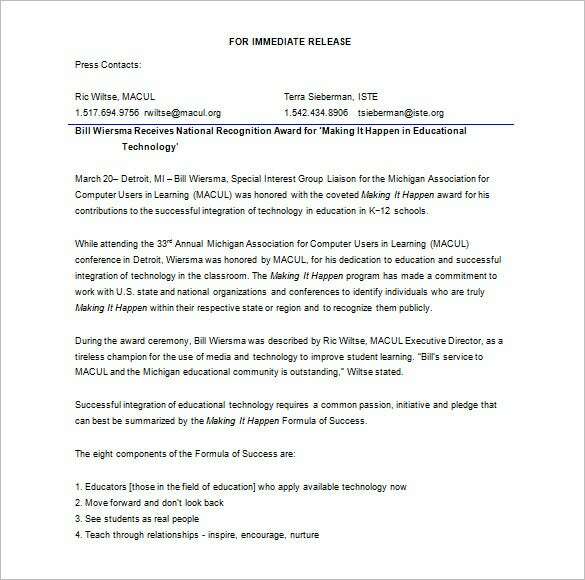 The press releases examples word doc are handy when you are about to format a PR for the first time. 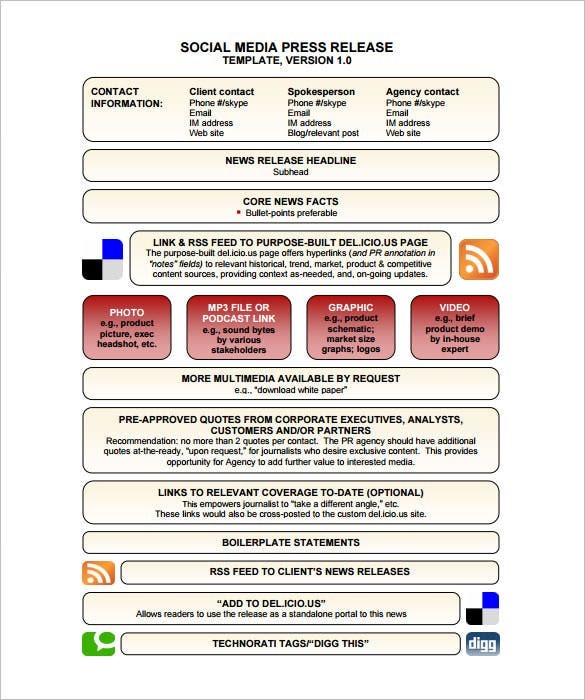 These examples help you to understand about newsworthy contents for your firm, how to frame the PR body, the average length of a standard PR and how to begin and conclude it with finesse.